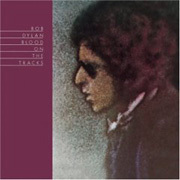 Buckets of Rain was featured on Dylan's critically acclaimed and best-selling album Blood on the Tracks, released in 1975. He plays it in an open tuning, which frees up the left hand for much more movement than is otherwise possible in fingerstyle arrangements. The downside of open tunings, however, is that you have to completely relearn the relationships of all the notes on the fingerboard. This is not such a big deal if you are working out a set arrangement you intend to play the same way over and over, but it's a serious piece of work if you want to be so familiar with the new tuning that you can improvise freely. To reach that goal, even one tuning offers plenty of challenges, thank you very much! So our arrangement offers a modest compromise: we borrow the lowered D string from the open tuning but leave the rest intact. Note that if you like the instrumental interlude Dylan plays on the following clip, you could work up something very similar in standard tuning as a solo. Great project! When Dylan first moved to New York City in the 60's, Dave Van Ronk was one of the established players in the Greenwich village folk scene to take him in and under wing. Van Ronk recorded a number of Dylan tunes over the years, including Buckets. Like Dylan himself, Van Ronk gives it a fingerstyle treatment, but adds his own personal touch by using a light calypso beat throughout. 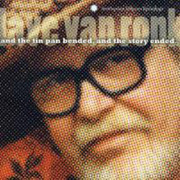 From the sound of it, this is played in the tuning we're using, drop D. The clip is from And the Tin Pan Bended and the Story Ended, a live recording of the last concert Dave Van Ronk played before his death of colon cancer in 2002. Maria Muldaur is another artist best known for her work from that era (Midnight at the Oasis ring a bell, anyone?) 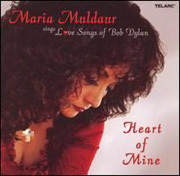 In 2006 she released Heart of Mine: Maria Muldaur Sings Love Songs of Bob Dylan and Buckets of Rain was among the songs she opted to include. In contrast to the solo arrangements heard above, here we hear the song performed by an ensemble which, despite their more diverse instrumentation, is closer to our approach. Listen to how each musician contributes her or his bit and creates an understated, but satisfying whole. I've included one vocal chorus and an instrumental interlude during which two electric guitars continue this ensemble interplay through what might otherwise be an opportunity to stand out and "solo". Instead, they stay in each other's mix, but out of each other's way. Nice.